Grows well in most states even some years in Warm Winter Areas, but will be marginal there in years with early hot summers. Harvests mid-late season - stores 7-9 months. Know where your food comes from - Buy Direct from our growers below and Save. Yugoslavian Hot is an excellent Porcelain garlic offered by Ben Ronniger from Moyse Springs, ID. It is new this year and we will soon have a more complete description of it. Its flavor is very strong and robust and sticks around for a long time. From a grower's perspective, it is a tall dark green very hardy plant and is a very good survivor, usually grows healthy and appears to be somewhat resistant to many of the diseases that can affect garlic. Yugoslavian grows well in all but the most southerly states, where it grows fairly well in cooler winter/spring years but is marginal in years with early hot summers. 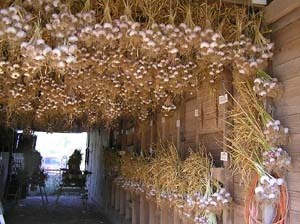 Do you grow large, clean bulbs of gourmet garlic organically? Contact us to see if you qualify for our market.